Though the latter two have never met, Massachusetts Democrat Martha Coakley sees no problem tying Republican Scott Brown to Rush Limbaugh. With just a week to go in a special US Senate race Coakley thought she'd won outright in the primary, a surging Brown has given the entrenched establishment politician the scare of a lifetime. Particularly alarming for Coakley: polls showing high favorable ratings for her opponent in a state where that isn't normally possible. Worse, one overseen by a Democratic pollster shows him ahead by one point, usually unthinkable. Finally, in what must be unbearable for the controversial Attorney General, Brown successfully raised more than $1,100,000 today as part of an Internet "money bomb" campaign. That's a staggering sum, money that can immediately be used to buy television ad time for a campaign that had been until now terribly short of it. That has a desperate Coakley restarting her moribund campaign as quickly as possible. Having blown her wad during a contested, four-way partisan primary, Beltway lobbyists are riding to the rescue with a big-bucks DC event. We've seen Democrats attempt to use Rush as a weapon in the past, but has it ever worked? How about the billboard that was to be erected near El Rushbo's home in West Palm Beach? Whatever became of that? While Dems would have voters believe Coakley's got the race in the bag (thanks to a "leaked" internal poll that featured heavy oversampling from their own party), look at their actions, not their surveys. Worried that Brown may indeed pull off one of the greatest political upsets in American history, they've dispatched a top aide to fix Coakley's campaign mess, made it clear they will stall Brown's swearing-in as long as possible and unveiled attack ads featuring Rush and Bush. Does that sound like confidence to you, or sheer panic? Limbaugh speaks for the GOP, therefore anyone who who is a Repugs should have him hung around their neck. Anyone notice? Massachusetts is spelled wrong in Coakley's ad. Nothing could come across as more sincere and believable. Nice job! Limbaugh actually does not speak for the GOP. Most of the GOP is very much like the Democrats now days. The people are speaking and they're not listening. So they are going to die politically. Anonymous, based on your comment (noun-verb agreement, and the redundant "who"), and Coakley's ad, it seems like you democrats should have a dictionary hung around your necks. Come on dems cant you put out an ad thats not a year out of date? Bush has been out of office for a year. Rush is not the voice of the GOP. And your Obama care stinks! How bout running on the issues not out of date slogans? 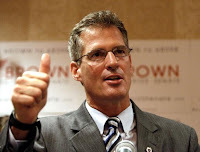 The democrats' usual "politics of personal destruction" and distration from the real issues of the day ... Go Scott Brown! Go Scott! I heard part of your debate with Coakley, you blew her away. You represent my values and principles. Not to worry you out there in the "Masses" when Brown wins a squeaker. Just hire Al Franken and his cronies to be sure the count is not right but to the left. Rush is nothing more than an entertainer. He admits that himself. Politicians have become so wrapped up in their own little personal politburos (with some exceptions) that whoever gives them the most money gets their vote. Maybe someone with half a brain will finally put a bolt in the crankcase of this thing called Congress. If you at least voted then you are allowed and encouraged to comment; if you didn't vote then shut-up and take what you get. Saw your post on FR--posted to my blog!